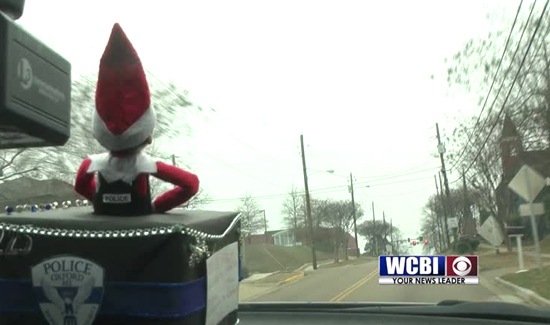 The newest officer on the Oxford, Mississippi, Police Department has a special spot whenever he is on patrol. Officer Badges has been on duty, with his own special vest, after a fellow Elf named Glitter, came up missing during the recent Christmas parade. Luckily, Glitter was found the next day, and Badges has been on the job—and on Facebook—ever since. “He contacted us and wanted to come in and be a support personnel for us, so he’s done that,” said Oxford Police Chief Joey East. Indeed, this officer, with badge number 12 25 has made the rounds, visiting schools, sitting in on a department head meeting with the mayor, and learning all about police work.He even piloted a drone above the famous town square. Chief East says Badges is without a doubt, the most popular officer on the force, and he is accepted by his fellow, taller colleagues. “At first, his size, they were worried about that, but since then they saw what he could do for our community and they have absolutely open arms supported Badges,” Chief East said. The reserve officer is taking his newfound fame all in stride.